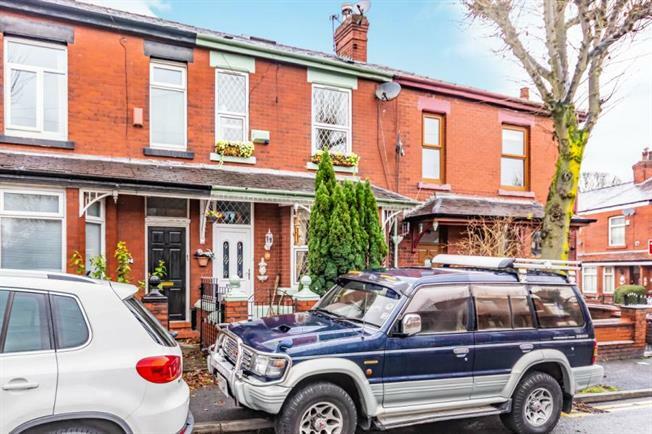 3 Bedroom Terraced House For Sale in Hyde for Guide Price £175,000. This stunning three bedroom terrace house is located in the very sought after area of Godley, conveniently situated for a wealth of transport links within the area, a selection of local amenities and then a range of reputable schools. In brief the property comprises of; entrance hallway, lounge, dining room, kitchen and W.C to the ground floor. On the first floor are three good sized bedrooms a family bathroom and access to the attic room. ENTRANCE HALLWAY - Entrance to this beautiful home is via the front door leading into the hallway. Large uPVC double glazed front facing bay window, log burner, radiator and access to the dining room. Fantastic sized room with feature log burner and access to the kitchen and lounge. Modern wall and base units, contrasting work top, range cooker, built in fridge/freezer, sink with drainer, radiator and uPVC double glazed patio doors. Master bedroom with uPVC double glazed front facing window, fitted wardrobes and radiator. uPVC double glazed front facing window and radiator. uPVC double glazed rear facing window and radiator. Bath with shower attachment, WC, wash hand basin, and towel radiator. Great sized additional room perfect for a multitude of uses. The front of the property is set back from the pavement with a gate and small paved area. To the rear is an enclosed paved yard which can also be used for off road parking.